Bloomberg TV India, the nation’s premier English Business News Channel today hosted ‘PATH TO PROGRESS Through FINANCIAL INCLUSION’, a unique initiative that brought together key influencers and decision makers like Govt. departments, Institutes, ministries to effectively address roadblocks in financial inclusion and deliberate on the mechanism for empowering the deprived set of the country’s population. Path to Progress through Financial Inclusion has been conceptualized in two phases, the first phase focused on the financial inclusion scenario at the regional level through discussions, absorbing key learnings, pain points and solutions. The second phase via a panel discussion will help chart out a road map to achieve 100% financial inclusion on the basis of the learnings and understanding gathered from the first phase. The high-powered panel comprised of eminent personalities from the BFSI Sector viz., Mr. G. Padmanabhan, Executive Director - RBI, Mr. MV Tanksale, CMD - Central Bank of India, Mr. Rajiv Sabharwal, Executive Director - ICICI Bank, Mr. Bhargav Dasgupta, MD & CEO - ICICI Lombard and Mr. Manish Khera, CEO - FINO PayTech. Bloomberg TV India, today at the event also released the “Financial Inclusion Report” which captures the issues in the regional level and proposed recommendations. The report was unveiled by Dr. K C Chakraborty, Dy. Governor – Reserve Bank of India who graced the event as the Guest of Honour. 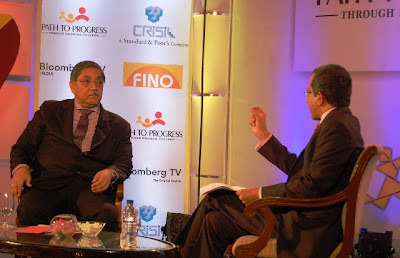 In the first phase, Bloomberg TV India organised a series of regional panel discussions with key delegates in Hyderabad, New Delhi, Lucknow, Raipur and Patna to discuss the regional nuances of financial inclusion as well as the bottlenecks, solutions, policy framework and technology faced by key stakeholders. The panel discussions were attended by representatives of the State Government, Institutes and Ministries involved in the Financial Inclusion value chain in the State. The second phase of Path To Progress was the panel discussion held today to highlight the need to focus on achieving complete financial inclusion at the national level by incorporating learning, trends and solutions discussed at the panel discussions held at the regional level. The panel discussion was attended by senior representatives from Ministry of Rural Development, Reserve Bank of India, Finance Ministry, Banking industry, Research Consultancy Firms etc. Mr. Manish Khera - CEO, FINO PayTech, speaking about the initiative said, FINO PayTech is the leading payments technology service provider and operator of the largest BC network for banks, state and central governments, government agency, etc. As leaders, we are supporting Bloomberg TV India in the initiative of discussing the way ahead for financial inclusion via ‘Path To Progress—Through Financial Inclusion'. This initiative has helped us to share our learning and experience with the leaders from various stakeholders in the industry and showcase our commitment to the cause of financial inclusion. Through this initiative FINO PayTech wishes to bring out the dynamics of on-ground reality, implementation, infrastructure and customer requirements to get the inputs of the thought leaders and visionaries and key stakeholders of the ecosystem and lay the path to progress of India through financial inclusion. With this we have also established the Financial Inclusion Day on April 23, 2013, that will give us a reason to come together each year to take up the cause of complete financial inclusion. Bloomberg TV India, today established April 23rd as FINANCIAL INCLUSION DAY, which each year promises to bring together the key stakeholders from the BFSI sector to recapture and measure how the country has progressed in the previous year in terms of financial inclusiveness and discuss the growth prospects, road blocks, effective measures to be taken and the road map to improve the state of financial inclusion in the coming year. FINO PayTech, India’s largest player in the financial inclusion space, has partnered with Bloomberg TV India in the Path To Progress – Through Financial Inclusion initiative. Bloomberg TV India is distributed by Reliance Broadcast Network Ltd., the multi-media entertainment conglomerate from the Reliance Group specializing in creating and executing integrated media solutions for brands.